To create a relaxing and welcoming space for our little one that reflected a life of traveling and discovery (those from the past and those to come). I wanted to incorporate objects from around the world as well as books from my childhood (in Spanish) and accents from Brussels (my husband's home town). As we often have family/friends visiting from overseas it was a must to have a daybed! We love the one we found and the six large storage baskets underneath will surely come handy for toys, linens and diapers. It all started with the wallpaper that had scenes from different landmarks around the world. We also knew from the beginning that we wanted to have elephants as we had fallen in love with Eames elephant during a recent visit to Vitra Haus in Germany. Elephants remind us of Kenya, a favorite spot for both of us (hence the safari angle was added too!). Wallpaper, Eames elephant and the little elephant clock (gift from a friend from NYC). It really helped me to start with a design board collecting fabrics and photos of objects I wanted to incorporate. I LOVE this modern, sophisticated baby boy’s nursery!! The decor is clean yet warm and tranquil. I love how much thought and attention went into each detail- all the meaning and love behind the wallpaper, Spanish and Belgium books, elephants, decor, etc. WELL DONE!!! Thanks for the great ideas!! I love the design and decor choices you have made! It’s a very diverse and fun mix of new and old, local and international. Can you let me know where the day bed came from? We are looking for something exactly similar. Thank you! Such exquisite tastes… It looks so peaceful and beautiful you’ll have your little one sleeping soundly in no time! Love the Eames elephant, wallpaper, and muted palette – an urban jungle every boy would be happy in! Thank you so much for your words! The bed is the Stratton daybed with baskets from Pottery Barn. We are now thinking about getting a real twin mattress for it (we bought the large pillow/mattress that they had). Their large pillow/mattress is ok for naps or one night but a regular twin mattress will be more comfy for longer stays. What a lovely room. So elegant and harmonious. It has a serene and spacious atmosphere that reminds me of a New England seaside cottage. I can imagine it bathing you, baby, and guest in deep tranquility. Think Martha Stewart would highly approve! My favorite touch is the blue bows on the crib. Over fourteen years since we met, and you still haven’t stopped amazing me Vale! I love it: can’t wait to meet my prodigio del ajedrez! this room is wonderful and will give your son a true global perspective! Lovely wallpaper and the safari details. That white elephant thingy is the one from PBK Eames? It looks very unique and interesting. Supreme! You have the ability to express in the decoration a life of travelling and the future plans for the petit traveller. I like the color combination, very relaxing! I love the references to animals in every thing, it is a way of transmit from the begining the love and respect to animals and the nature. Congratulations!! I love this nursery – beautiful space. Where did you find the prints above the changing table? Thank you. The prints are from Etsy (Jenna Sue Design). Seller is great, not only you get to customize the colors but also the background effects (you can’t really tell from my photo here but I have several different backgrounds, a zebra one, a dark blue paisley one, etc). Very happy with how they turned out! Definitely recommend her! Thank you so much Niman! You made me smile! 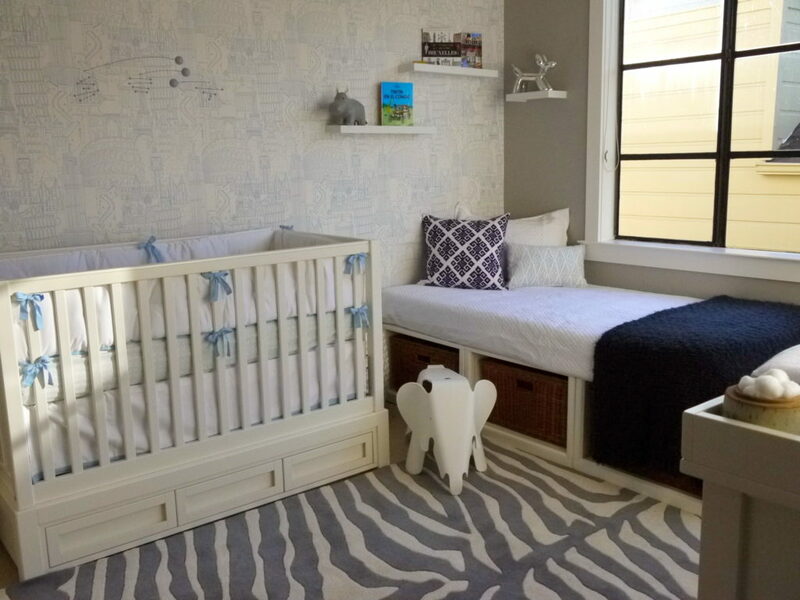 Someone just gave me the link here because my prints were featured—gorgeous nursery! Love the way everything came together and congrats on the feature! Where are the prints from that are in frames on the wall? they are wonderful! Just curious if you got the black mobile or the white mobile and painted it? Apologies for the late response. Indeed I got a black mobile and painted it with Serena and Lily chambray paint (I got a little sample can from them). I love your nursery, how can i find the prints of animals you used? Originally from Buenos Aires, I have been living abroad for over a decade and travel extensively for work and pleasure. I work in finance but have always loved design and have enjoyed decorating several places around the world.